Tag Archive | "boys basketball"
The Creative Technologies Academy boys’ basketball team came into Friday night’s game against West Michigan Aviation with something to prove, as they had lost to Aviation’s JV team last year. This time, they played the varsity, and the Chargers were focused and came to play their best. At the half, CTA was tied with Aviation, in a tight, back-and-forth affair. “I felt like we did a great job against the full court press in the first half,” said Coach Scott Bultman. The Aviators built a ten-point lead going into the fourth quarter. The Chargers held their own throughout the fourth quarter, but couldn’t make up the gap from the third quarter. The final score was 50-39. Sophomores Dawson Armstrong and James Hofstra led the Chargers in scoring with 17 and 12 points, respectively. CTA is off for the rest of the week, with their next games coming against West Michigan Academy of Environmental Science on Tuesday, the 19th. Cameron Link looking to take a shot against Wyoming Park. Photo by K. Alvesteffer. On Monday, February 3, the Cedar Springs varsity boys basketball team took on the Wolves of Wyoming Park. It was a tough battle between the Red Hawks and the Wolves, but in the end Wyoming Park took home the win 72-60. At the end of the first quarter, the Red Hawks were leading 23-21. The Wolves came back after the first quarter and scored 14 more points, but that wasn’t enough to take the lead away from the Red Hawks. Cedar Springs went into halftime leading 38-35. Wyoming fought back and came out after halftime and scored 15 more points to take the lead. Cedar Springs tried to come back after the third quarter and scored 13 points in the fourth, but it wasn’t enough. Wyoming scored 22, giving them the win 72-60. “Wyoming is a good team, with a lot of athleticism. It was a good for us to play a team that plays a little different style,” commented head Coach Jeff Patin. Senior Cameron Link and junior Brad Brechting led Cedar Springs in points. Link had a total of 30 points with a shooting percentage of 47.6. Brechting was right behind him coming in at 20 and went 9 for 12 on all of his shots. Wyoming’s Nick Staten led the Wolves in points coming in at 23 and went 7 for 14 on his shots. Coming in second for Wyoming was Jacob Traylor with 17 and a shooting percentage of 35.7. “I thought we played well for most of the game. It was an up tempo game and we were playing our 3rd game in 4 days, and with about 2 minutes to go, we just couldn’t get the big stop or a basket,” stated Coach Patin. 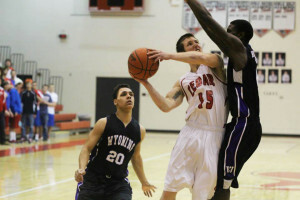 The boys varsity basketball team also played Forest Hills Eastern this week on Friday, February 7. This was the second meeting of Cedar Springs and FHE. The first time the Red Hawks played the Hawks Cedar Springs defeated FHE 61-57. In this matchup, it was very close at the beginning. At the end of the first quarter, Cedar Springs was in the lead 20-14 over FHE. After the first quarter, FHE came back fighting hard and scored 11 more points to make the score 30-25 still in favor of the Red Hawks. After halftime, Cedar Springs was still in the grove and added 19 more points to their score to stay in the lead. At the end of the third quarter the score was 49-40. FHE tried fighting back during the fourth, but it wasn’t enough. The final score was 70-55 with Cedar Springs defeating FHE. “It was a good win for us. This time of year it’s good to win even if you haven’t played your best,” said Coach Patin. Junior Brad Brechting led the team in points for Cedar Springs coming in at a total of 20. Senior Austin Hilyer was not far behind with 13 and Cameron Link came in third at 10. “We were able to string some good defense possessions together to extend the lead,” exclaimed Coach Patin. The boys varsity next game is Friday, February 14 at West Catholic. The team will be looking for their 11th win. So come on out and cheer on your Red Hawks!